So Halloween came and went, and we are now onto Fireworks Night. This year has just flown past. Christmas is just 49 days away!! I'm sure you always groan when people talk about Christmas in November, so we must apologise for that one. 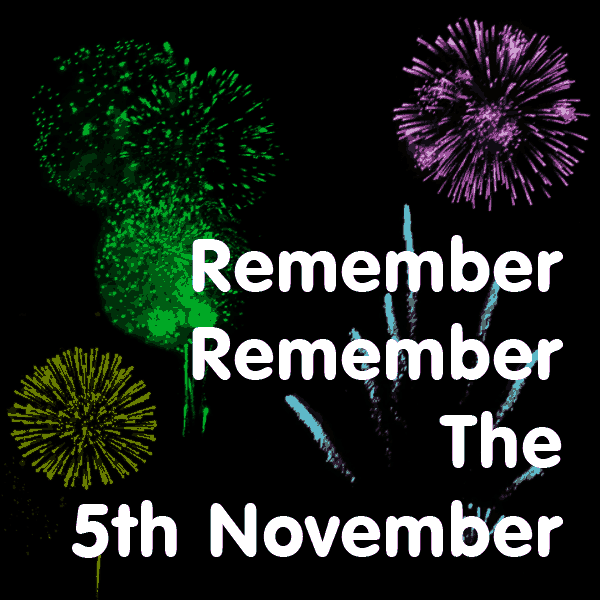 Anyway, the 5th November, associated with Guy Fawkes and the Gunpowder plot. We know it is a bit obvious to write about Guy Fawkes on Bonfire Night, but there is quite a bit not generally known about why we celebrate Bonfire Night. First of all, we know that Guy Fawkes had a plot to blow up Parliament. I've heard it said that he was the last person to enter Parliament with honorable intentions - that seems a bit harsh but is funny. The plot actually took place on the 5th November 1605. Guy Fawkes was arrested guarding barrels of gunpowder under the House of Lords. The celebration was actually about the fact that King James I had survived the attempt on his life. It became an annual thanksgiving for the plot failure. It took a few years, but Gunpowder Treason Day became a major English festival but became very religious. The day turned into a very anti-Catholic celebration where people would burn effigies of the Pope. Over time, the effigies became Guy Fawkes, although he was hung, drawn and quartered, not burnt. In the 18th century, enterprising children started to wheel the effigy around and ask for money. Guy Fawkes himself gave his name as John Johnson when he was discovered and arrested. When one of his targets, a Lord, asked him what he was doing with so much gunpowder, allegedly, he said his intention was " to blow you Scottish beggars back to your native mountains." He was tried with 8 other conspirators on the 27th January 1606. Naturally he was found guilty and his execution ordered. Of course, it has become a huge celebration today, with millions of people each year ooing and ahing at fireworks. We hope you have a great Bonfire Night, but stay safe, there are always far too many sad stories of people getting hurt.